Carol L. Butzen , “Mitzie”, 85, of S Business Drive in the Town of Wilson, died Saturday, March 15, 2014 at St. Nicholas Hospital in Sheboygan, Wisconsin. She was born January 26, 1929 in Port Washington, Wisconsin to Leo and Rosalia “Sally” Rodesch Pierringer. She grew up on E. Cleveland Street in Port Washington and graduated from Port Washington High School in 1946. She attended the La Crosse Teacher College, graduating in 1950 and taught in a one room schoolhouse south of Port Washington for several years. On May 8, 1954 she married Arthur Butzen at St. Mary’s Church in Port Washington. Together they had a crop farm in the Town of Wilson and raised Quarter Horses and Percheron Draft Horses. Carol was a gifted seamstress and made dresses for her mother and herself. She also made doll clothes from the fabric scraps. For many year Citizens Bank of Sheboygan would hold doll clothes competitions which Carol delighted in entering. 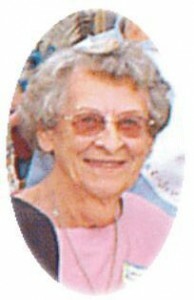 She also enjoyed gardening, bowling and meeting her brother at Newport Shores every Friday. She was a member of Immaculate Conception Church in Sheboygan. Her husband Arthur preceded her in death August 9, 2005. She is survived by her brothers Loschel (the late Ruth) Pierringer of Port Washington and Jim (Bonnie) Pierringer of Eden. Further survived by siblings-in-law Robert (Jean) Butzen of Sheboygan, Frank (the late Violet) Lohr of Sheboygan Falls and Mabel Brestrich of Sheboygan, nieces, nephews, other relatives and friends. Preceded by her husband Arthur and brother-in-law Raymond Butzen. The family would like to thank the staff at St. Nicholas Hospital and Sheboygan Progressive Health Center and Carol’s good friends and neighbors Jack and Ann Jenko and Wayne LeClair. Abiding by Carol’s request, no services will be held. She will be cremated with interment at St. Mary’s Cemetery, Port Washington. Thinking of you Loschel and sending prayers and symphathy for your loss.